Open the Templates window by issuing the command odstemplates (odst for short) in the command line of the SAS windowing environment. 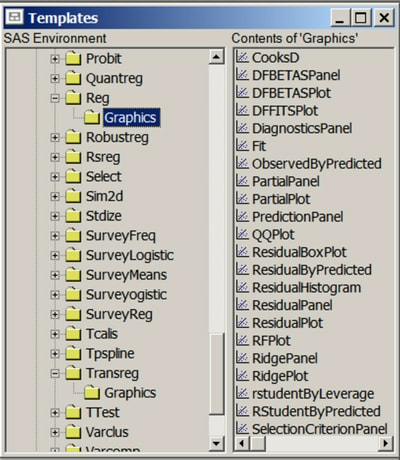 The template window is shown in Figure 21.33. If you expand the SASHELP.Tmplmst node, you can view all the available templates and double-click any template icon to display its definition. This is illustrated in Example 21.5. Use the SOURCE statement in PROC TEMPLATE to display a template definition in the SAS log or write the definition to a file. NOTE: Path 'Stat.Reg.Graphics.ResidualPlot' is in: SASHELP.TMPLMST. The word "Path" in ODS refers to any name or label hierarchy. In the note, the levels of the template name form a path. In the trace output, the levels of the plot name form a different path.